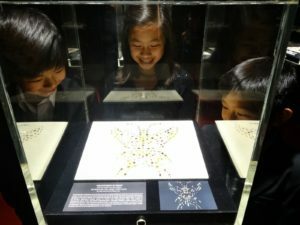 Continuing its commitment to keep content relevant and exciting, the Perot Museum of Nature and Science unveiled a refreshed Lyda Hill Gems and Minerals Hall this week. The Eyes of Africa, a show-stopping “alien eye” fluorite from Namibia on loan from Lyda Hill, gets its proper due in a larger case with updated details about its intriguing backstory. A third case displays a magnificent example of stibnite with robust clusters of crystal formations recovered from an industrial mine in the Jiangxi Province of China. Rounding out the premier cases is the beloved “grape jelly” geode – a 5-foot-tall amethyst geode – that invites guests of all ages to crank it open for a glittering peek. With colors ranging from fiery orange to tranquil blue and rosy pink, the “Aurora Butterfly” took 12 years to create and is adorned with diamonds from nearly every continent on Earth. On display through spring, the “Aurora Butterfly” is surrounded by a rainbow of mineral cases each dedicated to a different color.